One area of amateur radio that has been deemed too technical and difficult by many is operating through the amateur satellites or OSCARs (Orbiting Satellite Carrying Amateur Radio) – but this is so far from the truth. The first OSCAR was launched on the 12 Dec 1961 and was built entirely by radio amateurs in their garages. The early OSCARS were just beacons and had fairly short lives. But they provided the foundation for future developments. Remember this was only 4 years after the USSR had launched the first satellite Sputnik 1. Since those early days over 70 OSCARs have been launched, some more successfully than others! One of the remarkable achievements is OSCAR 7 (AO-7) which was launched 15 Nov 1974 and is still operating 38 years later – I wonder how many commercial satellites have lasted as long? Initially I operated the sats using fairly basic equipment – FT817 for 70cm and an IC-290 for 2m the aerials were a 2m 4 element yagi and a 70cms 10 element yagi both on a cross boom at a fixed elevation of 25 degrees so only adjustable in azimuth. My setup has not changed that much just the addition of a TS2000E in place of the two other rigs. Because of the Doppler Effect creating constant frequency shift it is easier to track saellites using specialist software. I use HRD and SatPC32 – both of which can be connected to my rig via an interface and can control the transmit and recieve frequencies to account for the doppler shift and also control the azimuth and elevation of the aerials through a rotator interface. Why did I need two rigs when the FT-817 will cover both 2m and 70cms? Simple I needed to operate full duplex in order to operate through the transponder satellites AO7, FO29 & VO52. 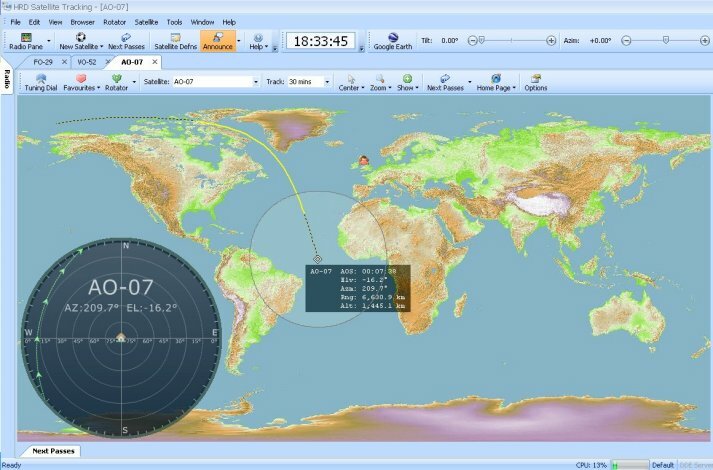 The FM repeater satellites, SO50, AO27, can be worked using just one radio such as a handie or the FT-817. The TS-2000 is one of the few commercial rigs capable of full duplex operation. 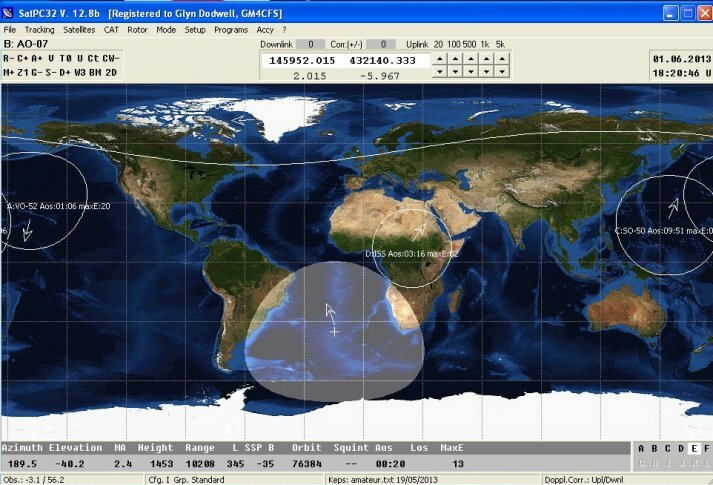 The author uses two different software packages to operate the satellites. Both packages provide frequency control and Doppler shift via a CAT cable and can provide rotator control to track the satellite. Each package has advantages over the other but on the whole they are fairly equal in the facilities that they provide. The first is SatPC32 available from various sources but all proceeds go the AMSAT. The second is Ham Radio Deluxe which despite early issues with the software is now a good package.